Who doesn’t love a vacation? I really like being on holiday and this one was going to be great. Why? Because I was going to see Oprah! My husband, Tommy, wanted everything to be a surprise. He arranged our itinerary, so I only knew some basic details. We were going to Houston for 5 days to attend Oprah Winfrey’s “Life You Want” tour. It is a two-day empowerment gathering, highlighted by motivational and inspirational speakers and exercises. I was so excited because I could always use some extra motivation and inspiration in my life. We arrived in Houston Thursday afternoon and I felt pretty good, just a little tired from the ride. The event was Friday and Saturday, so I had some time to rest up for the activities. We checked into the hotel, got some food and I went to sleep early. Friday morning, I felt a little weak but that usually is the case for me most mornings. We got breakfast then walked to the first event. It was taking place outside and the Texas heat began beating me down. I could feel myself getting weaker by the moment. Just when I was about to give up, my first surprise happened. Two of my long time friends showed up. One resides in Houston and the other resides in Dallas. Then I found out it wasn’t a coincidence. They were going to give me a party the next day at my hotel. I couldn’t believe they would do that for me. After an hour outside with my friends, I told Tommy I wanted to go back to the hotel room and rest up for the night events. 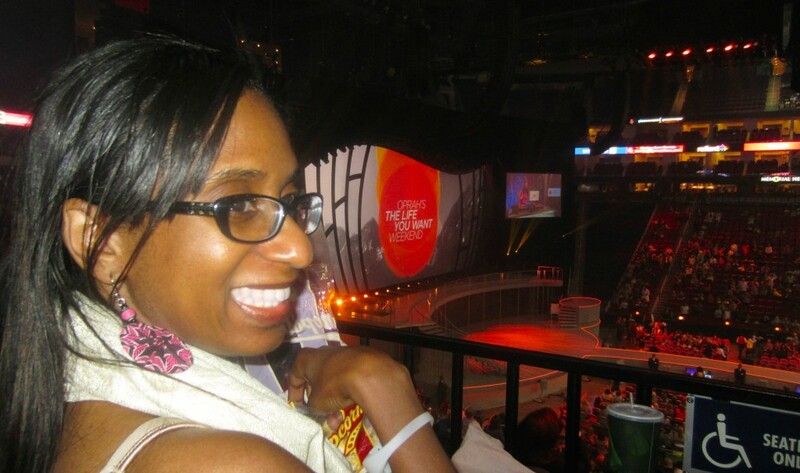 I was so happy the next part of the experience would take place inside the Toyota Center Arena. Yes, it would be nice and cool. When he told me, I was almost speechless. Once we got back to the room, I tried to rest but my mind was racing. After about 3 hours of being in bed and trying to relax, it was time to go. I was still feeling a little woozy after my rest but I was so excited I pushed through it. So off we went to the event. During the walk to the arena I was seeing double. It finally stopped when we got inside and I could feel the cool air on my face. We found our seats fairly quickly and 45 minutes later the event started. Oprah spoke for 2 straight hours and overall it was fantastic. At the end of the presentation, a lady I have never seen before approached me and said, “Mrs. Lemelle please stay in your seat.” Ten minutes later she escorted us through various back doors and elevators leading us into a skybox inside the Toyota Center. She told us to wait and someone would be with us shortly. Two men in suits, wearing two way radio ear pieces, asked us to empty our pockets and leave my purse, cell phone and camera and we could get everything back after the reception. We were then brought into a room and I looked up and there she was. Oprah! It was just my husband, a photographer, Oprah and myself in the room. And of course I forgot what I wanted to say to her. I did tell her, I had MS. I replied, “I was diagnosed in 2000 “. She told me she would be portraying Richard Pryor’s grandmother in an upcoming bio picture and gave me some details on how she was thinking of playing the part. She said it called for her to use a lot of cuss words. The photographer interrupted the conversation to announce he was ready. We all got into place, smiled and he snapped a picture. 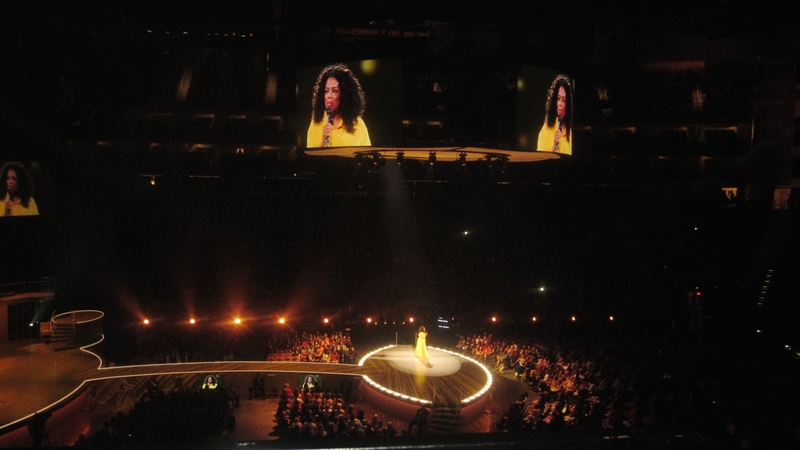 Oprah said goodbye and we were escorted back into the skybox over looking the arena. There were about 50 people in the room and Gayle King was greeting everyone. A woman walked up to us and handed me a copy of the picture we took with Oprah. She then told us to stay and enjoy the open bar and food. Normally I would jump at free drinks and food but at this point I was on my last legs. I asked Tommy if we could leave and I could see the disappointment on his face. I assured him meeting Oprah was great and I just wanted to get back to the room so we could get an early start to day 2. We picked up our personal items on the way out and I was so happy to be heading back to the hotel. After getting into the room, I took a shower and quickly got into bed. Three hours later I felt terrible. The room was spinning and I was confused. I asked Tommy to help me to the restroom. Then everything went black. I really don’t recall much else. I just have glance accounts of what happened. I could hear them but I couldn’t answer back. I remember seeing people walking around but my view was very faded. My eyes were going in and out of focus. That was it. I remember nothing else, until I woke up in an ER room lying in a blood stained bed. Wow Nicole, It was great hearing about Oprah. You do get around. I am sorry about the hospital trip. So cool that you got to meet Oprah, and take your time to write about “the rest of the story”, because if you can’t remember, you sure have a heck of a start to make up something that could be really interesting and believable! Hope you’re feeling better and thanks for all you do. 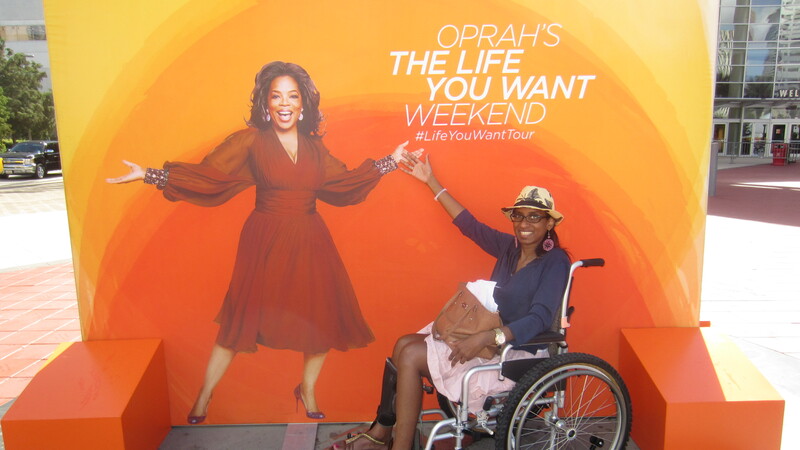 You deserved this fabulous trip to see friends and Oprah! The room was full of positive people which lifts everyone up!! I wait to hear about your visit to the hospital. I love the pictures! Man- what a horrible finish to an awesome story. What happened? I know you’ll tell us in the next post but I am hoping, praying and wishing that you got to enjoy the rest of the surprises that went along on the trip. Damn MS for wanting to be in on EVERYTHING! But so, so glad you had such a wonderful first part of the story.Oprah’s the bomb! What a cliff hanger! Since you’re writing this, I suppose it has a good ending, but I’ll be on pins and needles waiting! So glad you got to meet Oprah — what a wonderful surprise. Girl, you have one fantastic hubby to set that up for you! How do we get into these crazy situations, Nicole?! I got your message but alas it was 4 a.m. in Spain and my phone was off. But I have the perfect question to ask Oprah: If you could meet one famous person (living) who would it be? I wonder what she would say, since she is often the answer for a lot of folks. And I’m so thankful you are out of the hospital and able to give us this amazing update. Best to Tommy. I agree with everything Laurie said. I can’t wait to hear the rest. Feel better! Bigger than life experience for certain. So sorry about the episode at the end. Wish that Oprah could read your account of the weekend….I think it would give her some insight into what we live with each day!!! I love and look forward to reading your bogs. But wow what a cliff hanger! Lol Now I really can’t wait for part two. I hope everything worked out ok. Guess meeting Oprah had a big impact huh? I am so happy that you are okay now. What an experience. I was quite worried when I heard nothing and then I saw you were in the hospital! Wow, what a story. I am so glad that you got to meet Oprah. I am on the edge of my seat waiting for the rest of the story. I hope that you are feeling better and recovered from your vacation. Nicole – oh my- I know there is a good ending to this because you are here to write this, but I want more. and I want it NOW!! Ok, I’ll stop channeling the spoiled children in Willy Wonka and compose myself. I love your husband for everything he does for and with you, including listening to you when you say ‘enough.’ Give Tommy a hug for me. As for you – what a wonderful start to a dream weekend. i hope there is a happy ending to this trip. I’m waiting for the next installment. OMG, Nicole, how can you leave us in this kind of suspense! Thank God nothing happened till after you got to meet Oprah, which is the dream of a lifetime! But then what????? Your husband is one in a million, by the way. It was too much to write about at one time. Part 2 is coming soon. I am working on it now. Yes, i know there is no pressure from me… but I want to read the next installment. Keep working on it when you feel the strength. hugs to you.